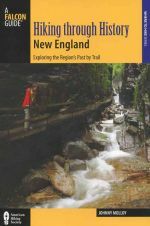 Hiking Through History New England: Exploring the Region's Past by Trail, by Johnny Molloy, 2015. An engaging guidebook that leads hikers through many aspects of New England's rich historical heritage. There are a variety of excursions described, from coast to mountains, with all six New England states represented. Many interesting historical nuggets are srpinkled through the text. Fully illustrated with color photos and maps. 244 pp., 6" X 9."